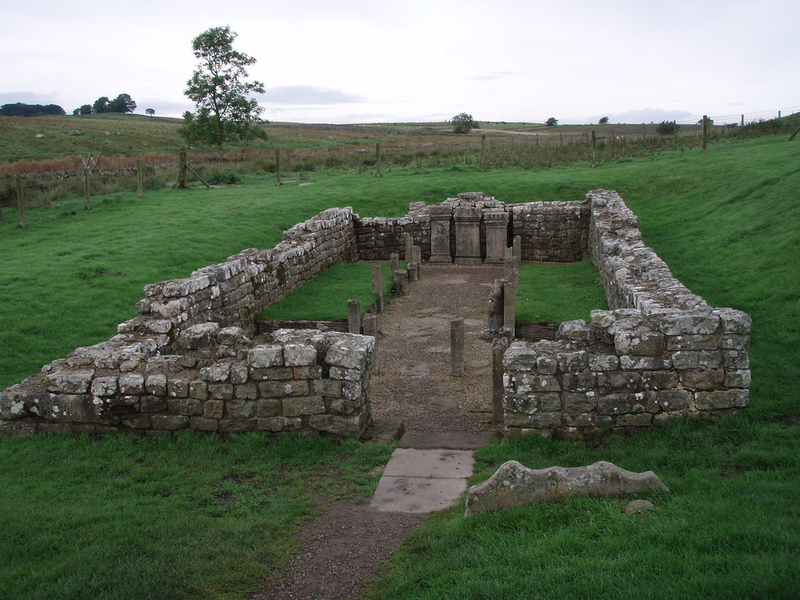 Carrawburgh Mithraeum (Brocolita) – Mithraeum. Our Common Sun. Located 80 yards S. of the S.W.-angle of Carrawburgh Fort, situated W. of 31 milecastle and 4 miles W. of the North Tyne at Cholterford. The temple of Mithras was excavated by I. A. Richmond and J. P. Gillam, disclosing three main stages of development, the second exhibiting two reconstructions. The earliest shire was a small one, and had been deliberately dismantled. It contained the usual anteroom and nave with raised couches or benches at each side, and a da�s for altars at the far end. In front of the altars lay a ritual hearth, fed with special fuel made from Mediterranean pinecones. Meals or sacrifices were represented by bones of young pigs, lambs or goats. The building was next enlarged, with bigger sanctuary, longer side-benches, and statues of Cautes and Cautopates. The first refurbishing of this shrine was more elaborate still. An ordeal pit was provided close to the ritual hearth in the anteroom, and the floor of the nave was covered with heather for silence and comfort. To this period belongs a fine wrought-iron altar-shovel, found on top of the contemporary side-bench. The second refurbishing was particularly interesting for its woodwork. Much was preserved in the earlier periods, but these remains were buried after destruction. The base of the wattle-work screen between anteroom and nave and the wattle revetting of the benches were exceptionally well preserved, together with the upright posts for furnishings in the sanctuary and board-flooring set in clay. When the second shrine was destroyed in A.D. 296-7, the stone furnishings of its sanctuary remained undamaged and were used again in the third building, which was found almost as its final destroyers left it. Three fine altars stood in the sanctuary, one with a notable relief of Mithras with radiate crown pierced for illumination. Below the altars a ritual pit contained a thin cup and a beaker with the skull of a fowl in it. Four little altars lay along the edge of the side-benches. The statues of Cautopates and Cautes had, however, been deliberately destroyed or disfigured and the relief of the bull-killing, forming a reredos in the sanctuary, had been removed, leaving only one broken fragment behind. There were also other traces of deliberate desecration. After this the building was left to decay and on becoming filled with peat began to collapse. One of its roof-beams was found among the ruins. Dating: beginning of the III century A.D.